By now, if you follow my blog, you know I have a new potting bench with a vintage cast iron sink. I would love to say I made it, but I didn't. My friend, Jodi Mann of Mann Made Signs and No Place Like Home Again created this beautiful potting bench. A red geranium is planted in a Silverleaf Lard pail while Blue Willow dishes are air drying in a rack in the sink. A vintage water pump stands on the sink drainer. These flowers were just planted so you will have to imagine what they will look like in a few weeks. Victorian ruffled pansy mix in a vintage angel food pan. Tea kettles with ivy, begonias and verbena. My wonderful geranium sign made by another friend, Deb, from the Tattered Angel. Some of my painted finds, an old high chair and the potato/onion bin. The ironing board is to the right of the bench, along with a scrub bucket. This is my version of an "outdoor kitchen". NO cooking required. I know you had fun creating this sweet little view down memory lane! Reminds me of "playing house" in younger days. Good Afternoon Carlene, Oooh, I would love a potting bench and yours is fabulous. I love the water pump and the row of blue and white dishes. Like you I adore blue and white. The little pansies you planted look so nice.... always reminds me of the flowers in Alice in Wonderland. May you have many hours of fun potting plants on this bench. Oh I love it Carlene, just absolutely love it! And the dishes and plants, and old tea-kettles, just love, love! Aren't you glad we can finally be outside and not seeing snow!!! My lilacs are blooming, come by and see if you can. That is the best outdoor kitchen I have ever seen!! Oh I really like your potting bench. Everything is perfect. I do wish mine looked as good as yours. Very cute. Looks like my grandma's kitchen for sure. Where is your dish fairy garden. I would have so much fun just checking out all your fun things inside and outside of your home. So cute. I'm envious of that sink! I'd love to have that in my kitchen! This area is so cute... you've done a great job. This is charming! Love your outdoor "kitchen". Such a clever idea! that sink just sends that potting bench over the top, LOVE it!! I'm still envious of your potting sink and that reminds me that I need to get Sam to go haul that one out of that old house. I plan to make one of these for myself girl! I saved your pic as incentive. It all looks so cool and I'm with you...an outdoor kitchen with no cooking is the best! My kind of kitchen. Your potting bench really is amazing. Love how you dolled it up for summer. It is summer isn't it? It's been quite chilly down here, so hope it's a little warmer up your way. Brilliant idea, using a coveted sink that many of us would love to call our own! No cooking...even better! The flowers all tucked away in the various vintage items are adorable and that sign catches my eye! Your outdoor potting kitchen is too cute! Just perfect, and my favorite kind of kitchen....no cooking!! Beautiful fun post! This is so sweet and whimsical! Imagine how it will be once the flowers fill in! Gorgeous! Love your outdoor kitchen...so cute!! I want one now! You have a wonderful backyard kitchen, Carlene! 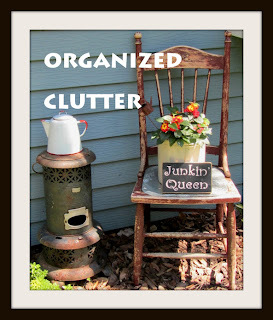 I like how things are organized, and the water pump and ironing board are definitely a looker! I must say that yours is one of the most beautiful outdoor kitchen I'd ever seen. Carlene I am loving that sink! I would love to find one and make a potting bench just like yours, your inspiration is amazing on this one!